It started with gorgeous weather. I mean better than perfect. Low 80's, no humidity and all day sunshine. The one problem I had all weekend was that my camera was at the bottom of my beach bag...uncharged. So much for capturing memories. On Friday Henry and Emma had planned to practice riding her two-wheeler, but she didn't want to go. She always makes these grandiose plans and lacks follow through. Wait, that sounds vaguely familiar. We ditched the bike riding and headed to The Circus Drive-In for lunch instead. If you're from or familiar with the Jersey shore, you know that The Circus Drive-In is a true shore landmark. Anybody who's anybody goes at least once a summer. Everything on the menu is good. Unfortunately, because of my dietary restrictions, I was very limited. I decided on the Greek salad, and I didn't regret my decision. After lunch, we bought Harper a two-wheeler. It's a 12" bike with training wheels...perfect for her. Now, the race is on to see who can master riding without training wheels first. I'll upload pics of Harper and her new bike as soon as I take some pictures of Harper and her new bike!! On Saturday, we celebrated my niece, Hayley's 18th birthday. Lots of fun, lots of food and lots of wine! I was able to get a few pics from Hayley since my camera was nowhere in sight. 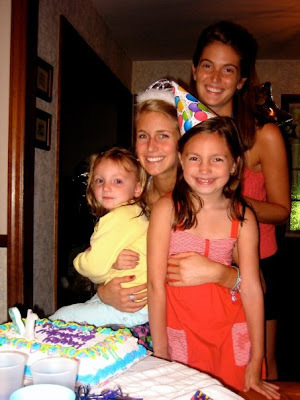 Here are Emma and Harper with their cousins, Hayley, the birthday princess, and Ashley. 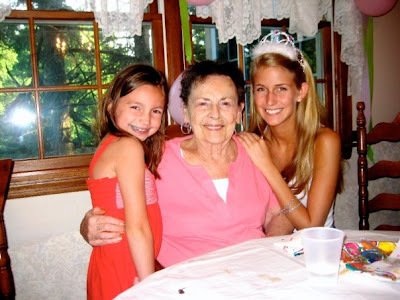 Here are Emma and Hayley with their Nana, my mother-in-law. So cute!! On Sunday, we wrapped up the weekend with a day of relaxation and one final bar-b-que. It was the perfect end to a perfect weekend. I'm glad the holidays were so wonderful for you. Sounds like you were busy! Bummer about the photos, whenever that happens to me I try to remind myself that it's more important to make the memories than capture them on "film".